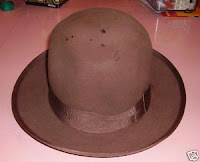 We often refer to the roles we play as hats we wear, but today I am literally writing about hats, specifically two hats I auctioned off on eBay recently. They were very similar in color and age, and both had been stored in the same hat box for the last sixty plus years. The only difference in them was that one hat was in mint condition while the other had some spots on the top of it. I think it all comes down to who I am trying to please, God or man? God is very clear that He is concerned with the condition of my heart, my inner self, and not the external. We all have twenty-four hours in a day and must make choices as to how we will use that time. How much time is spent on make-up and hairdo’s, shopping for just the right clothing and accessories and having the “perfect” house? How much would my life and the lives around me change if I invested that much time in God, in prayer and studying His word? Let's trust God and see!